When you look for a grinder for your french press, you don’t always know what to look for. Sure you want a smooth, fine grind, but how do you know what a grinder will do until it arrives at your doorstep? We’ve decided to take the guesswork out of finding the perfect grinder. We researched and reviewed some of the best grinders on the market to bring you a complete list of our top 10 favorite grinders. Choosing the best grinder for your french press can be a little daunting. Do you want to go with manual or electric? Do you have control over how fine the grind is? So we came up with six different features that will help you find what you’re looking for fast. Here are a few things to consider before buying a new grinder. Type: There are two types of grinders: electric and manual. Although many electric grinders give you the perfect grind, they can be much noisier than a manual one. If you live alone or everyone is up when you make coffee, then an electric grinder may be for you, but your family might love you more if you went with a manual style while they sleep. Size: Not all grinders are the same. If you want a small handheld grinder, be sure to look at our smaller sized options. For those with no preference, size may not be of much importance, but consider your coffee making space before buying. 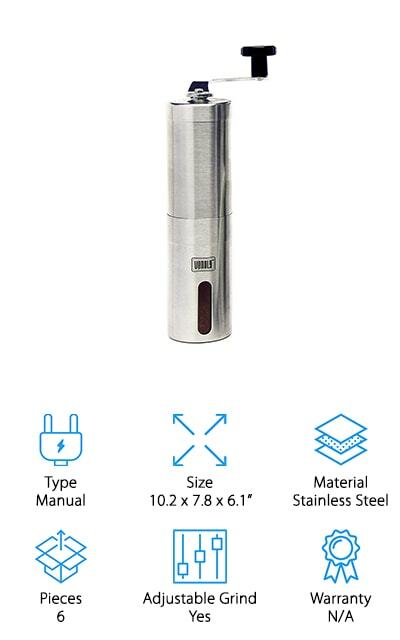 Material: You want a grinder to last you for quite a while. The material that it’s made of might be the difference between a few grinds or a thousand grinds. Also cleaning your grinder is important and certain materials are easier to clean than others. Pieces: Having too many pieces can lead to losing everything you need to grind your coffee beans. Look for a grinder with just enough pieces to get you grinding, but not so many that you’re looking through every drawer in the kitchen to get started. Adjustable Grind: Some coffee beans only need a little grinding, while others need a lot. Finding a grinder with multiple grinding settings can be a make or break for coffee connoisseurs. Check to see if the grinder of your choice has adjustable settings for the best french press! Warranty: No one likes a broken coffee grinder. Be sure to secure your investment in a grinder by finding one with a warranty. If something breaks or you’re not satisfied with your purchase, you want to get your money back or a replacement! Now that you know what to look for in your new coffee grinder, we’re ready to show off our top 10 favorite grinders on our list. Our top pick and budget pick are our very favorite options, but we also have a list of some other grinders we loved, too. Let’s press on and see the best grinders for french presses! Our top pick is what we believe to be the best manual burr grinder for french press! The JavaPresse Manual Coffee Grinder is a manual style grinder that comes with 15 different grinding settings. You have choices of coarseness from a Pour Over to K-Cup style grind. Each purchase comes with a handful of useful pamphlets to teach you about each setting, too. 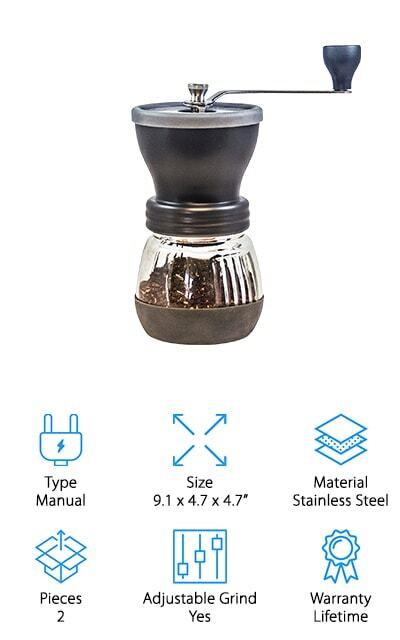 This coffee grinder doesn’t require any kind of cord or electricity, so you can pack it up and take it anywhere with you. The hand crank is removable and allows you to grind your coffee beans without all the noise of an electric grinder. The burrs inside the grinder are made out of ceramic and are tested to last over three times the amount of time than standard stainless steel blades. 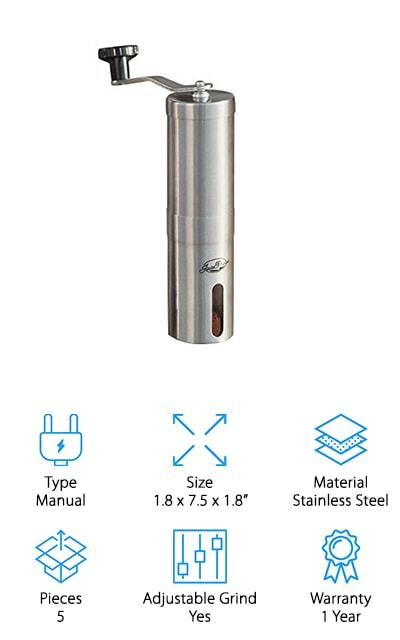 If you’re looking for a coffee grinder that accommodates travel with low noise pollution, the JavaPresse Manual Coffee Grinder brings any type of coffee to life anywhere you go! The Lucky & Son Coffee Grinder is our budget pick because it has all the bells and whistles you need and is easy to clean! This grinder comes with 6 pieces, including a removable crank and a cleaning tool. Made from stainless steel, this grinder is easy to clean and will last through any adventure. The ceramic burrs inside are also long lasting and durable compared to stainless steel blades used by other competitors. You can adjust the grind settings for different styles of coffee like French Press, Cold Brew, and Espresso. 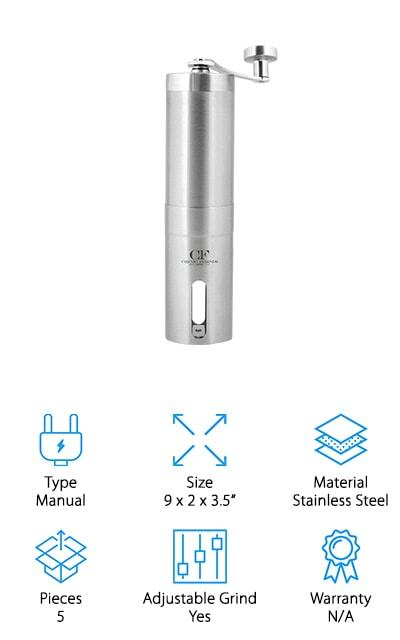 Perfect for travel or early mornings, this grinder makes almost no noises and comes apart in pieces to make room for other important items in your luggage. The grinder also comes with a waterproof bag to take on your travels and adventures. Whether you’re backpacking or in a rush to work, the Lucky & Son Grinder is the perfect grinder to bring along with you no matter where you go! The Coffee Gator Burr Grinder is another manual grinder that’s perfect for making coffee in the early hours of the AM. With 15 grinding settings to choose from, you can French Press or try something new to energize your day. Coffee Gator prides themselves on grinding each coffee bean evenly to avoid adding any bitter or sour tastes to your cup of joe. The grinder holds enough coffee beans for 5-6 cups of coffee. The stainless steel brings the durability and the bladed burrs bring the perfect grind. No cords, batteries, or electricity are needed. Just grab your grinder and make the perfect cup of coffee anywhere you need it. Coffee Gator had coffee lovers design and test their grinder so no coffee bean would die in vain inside a bad cup of joe. You can finally make barista standard coffee in your home without having coffee snobs make fun of you. Grab your coffee beans and get grinding with Coffee Gator! 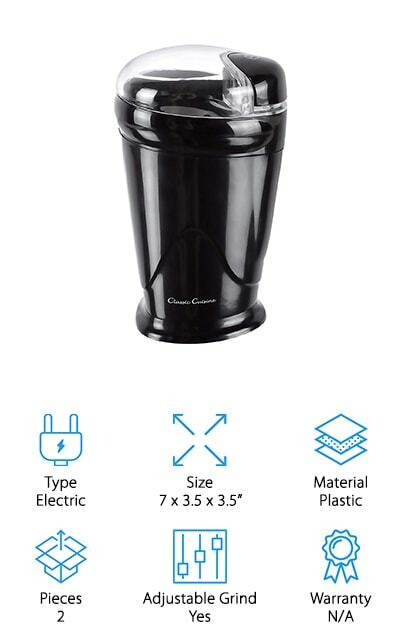 The ONORE CAFFE Coffee Grinder is a stainless steel grinder with 18 settings for a variety of coffee styles you know and love. From French Press to Turkish coffee, you can now make these barista style drinks at home with little more than your wrists. ONORE CAFFE has their very own patented screw mechanism to keep the grinding handle from falling off, giving you an easy and sturdy grind. The ceramic burrs will keep you grinding coffee for years to come as you won’t need to replace them for quite some time. You can take this grinder with you everywhere from your home to your office as it’s lightweight and the perfect size to fit in your luggage. With your purchase, you receive the grinder, a coffee bean scoop, bag clips for sealing coffee bean bags, and a cleaning brush. The ONORE CAFFE Coffee Grinder set gives you everything you need to make making coffee a breeze. Pick one up and see for yourself! For the serious French Pressers out there, the Venoly French Press Grinder Set is made for you! This set comes with 6 pieces: a french press coffee maker, grinder, replacement filters, a stainless steel spoon, a plastic spoon, and cleaning brush. With everything you need to make the best French Press around, you can have your favorite barista drink in your hands within minutes in your own kitchen. With 18 grinding settings, you can make much more than just your average French Press. Each crank of the handle will release all the aroma of coffee beans while maintaining the much needed oils to bring you the freshest cup of joe. The stainless steel on both the grinder and French Press coffee maker are rust and corrosion proof so you’ll have this set for many years. The coffee maker is also dishwasher safe, making clean up easier than ever. Grab the Venoly French Press Grinder Set for the French Press lover in your life. You won’t regret it! Chicho Friends French Press Grinder is considered by many to be the best coffee bean grinder for french press coffee. This 5 piece set includes everything you need to make your favorite gourmet coffee on the road or in the airport. You’ll find all the pieces to put your grinder to use, a cleaning brush, and a handy bag to carry everything in once it arrives at your door. The exterior of this grinder is made from stainless steel, while the internal burrs are made of ceramic. These two materials are the most durable and easy to clean when it comes to coffee stains and spills. Even though this grinder is durable and sturdy, it weighs in at a little over 12.5 ounces so it’s perfect for travel or camping trips where you want to pack light. It’s virtually noiseless so it’s great for when you want a French Press in the wee hours of the morning and don’t want to wake your family or tent mates. 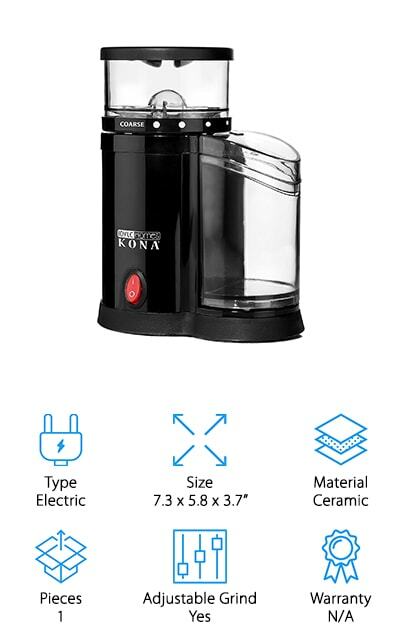 Our first electric grinder on the list is the KONA Electric Burr Grinder. With 9 grinding settings, you can adjust how coarse or fine you want your coffee. Each bean is ground with ceramic burrs, so you’ll have a fine or coarse bean every time depending on what setting you choose. This coffee grinder is perfect for you if you drink french press in small batches. 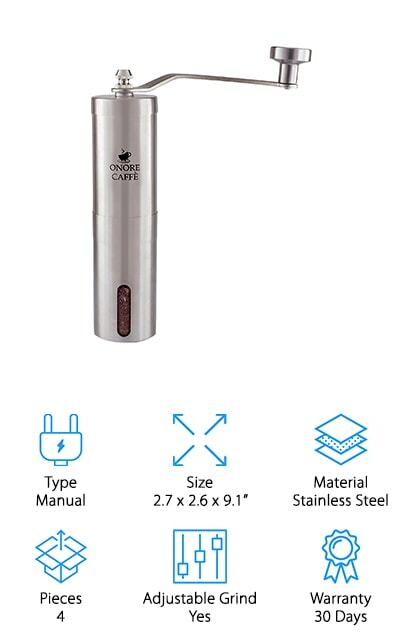 This particular model is the smallest electric grinder on the market but still packs the right amount of punch for whatever coffee drink you want to make. The bottom of this grinder has three separate suction cups to keep it on the counter when your beans are grinding. All you need to get started is a plug in, some coffee beans, and whatever setting you want it on. Turn it on and watch as your coffee beans are ground into perfect grounds for any barista style drink you’d like with the KONA Electric Burr Grinder. You’re looking at another manual stainless steel coffee grinder. The JOYSTAR Manual Coffee Grinder is also made with ceramic burrs to give you perfectly ground coffee beans every time. You can adjust the grind size in 3 settings: fine, medium, and coarse. The grinder holds enough beans to make 3 cups of coffee in one sitting. Mix 6 tablespoons of beans with 18 ounces of water and voila! Enjoy a french press or espresso. While you crank away, the ceramic burrs work to release all the oil inside your beans for a fresh, flavorful cup of coffee. The JOYSTAR Manual Coffee Grinder comes with an added bonus! When you purchase the coffee grinder, you’ll also find a replacement ceramic burr in case you ever need it. Pack up your JOYSTAR and hit the road, you’ll have the best burr coffee grinder for french press right at your fingertips. Just don’t forget the coffee beans at home! The Classic Cuisine Coffee Grinder is an electric grinder that works well for more than just coffee. You can grind up herbs, spices, nuts, and more with this grinder, too. You can grind your coffee beans down easily with the manual grinding button. Hold the button down for shorter periods of time to end up with coarse coffee beans. Hold it down longer for finely ground coffee. The exterior of the grinder is made out of durable plastic while the interior grinding blades are made of stainless steel. The lid-activated safety also gives you peace of mind knowing that the blades won’t begin to spin without locking the lid down firmly. This grinder conveniently makes an entire pot of coffee so you can share your freshly ground coffee with everyone in your family. The Classic Cuisine Coffee Grinder is the perfect grinder for your personal barista bar at home. Grind everything to your heart’s content and have fresh coffee every morning without having to leave a tip! Khaw-Fee’s Coffee Grinder provides you with the freshest cup of coffee, no matter where you are. 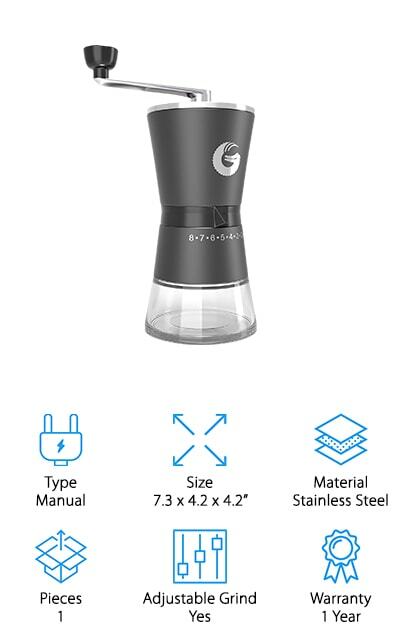 This stainless steel grinder gives you the option to grind based on what coffee you’d like. Made with a stainless steel exterior and ceramic burrs, you can expect this grinder to last for years to come. The hand crank makes grinding easy and quiet without disturbing your family while they sleep in the early mornings. There won’t be any guesswork when you grind your coffee beans anymore! 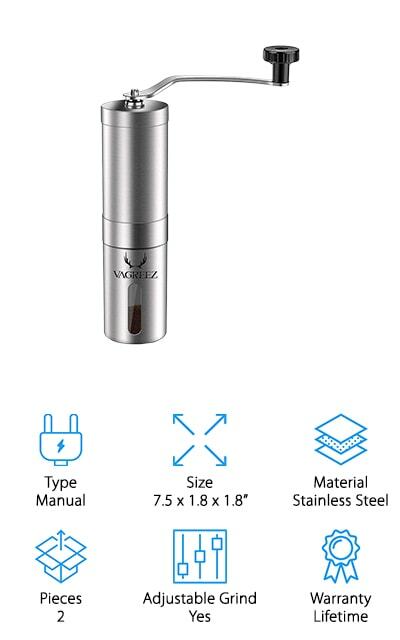 If you have any issues with this grinder, you have a lifetime warranty with your purchase so you can return or get a replacement anytime. Khaw-Fee prides themselves on giving you the very best and if you’re not satisfied, they aren’t either. 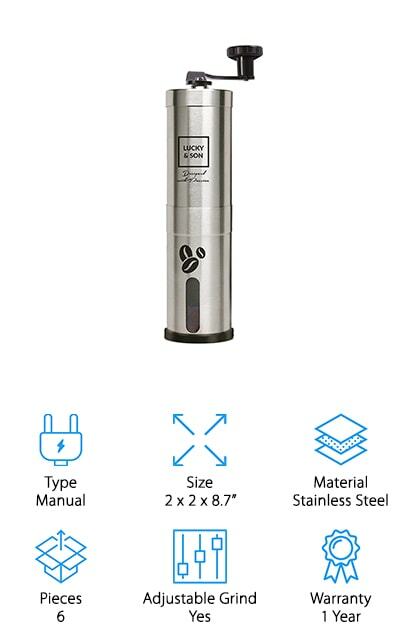 If you’re looking for the best hand grinder for french press coffee, the Khaw-Fee Coffee Grinder is one of the very best for fresh coffee on the go.